Using Sprytile on already created meshes? I just started using Sprytile and I'm absolutely loving it so far, definitely a powerful tool. I have constructed a mesh to use as a ground, and I wanted to go in and paint my grass texture onto the faces, however when I attempt to setup pixel texture on any mesh I have already created, without starting to build from Sprytile, I get an traceback error message. I'm not super versed in technical terminology as I come from an art background, so I'm not sure what the problem is exactly, but I'd like to know if this is a hiccup you are aware of? It works completely fine when creating a separate mesh within the edit mode of an object I had begun with sprytile, but I keep running into this error when attempting to paint meshes I had already built. Any suggestions or advice would be greatly appreciated! Thanks so much for putting this amazing tool out there. Hi Lemonworm, thanks for trying out Sprytile and for reporting this error. I'll look into it, but I'm not sure when I'll get back with a status. Hey so I actually found a rudimentary solution to this bug recently and thought I'd share it. 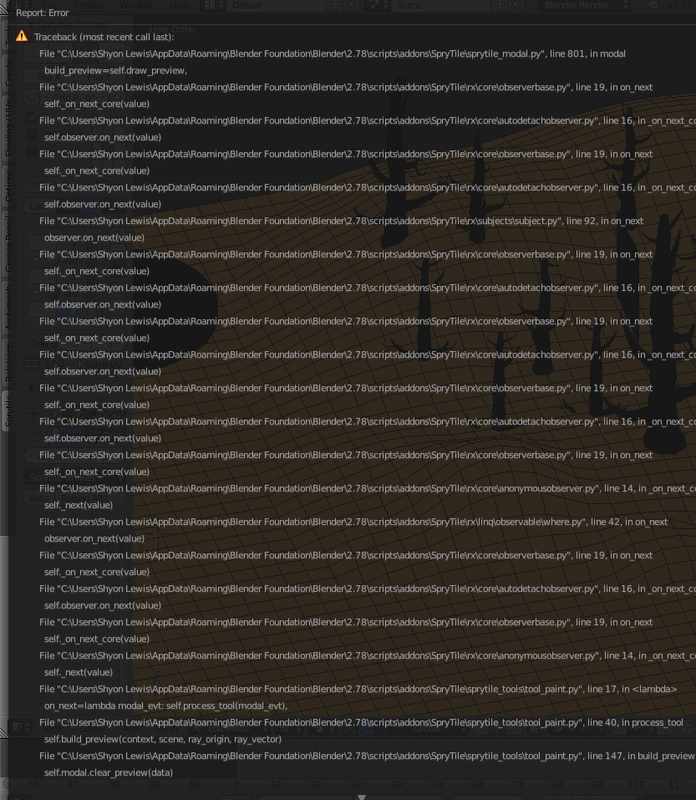 It seems sprytile has a hard time locating the original png when attempting to load tileset on any mesh which has been already created, as I learned when i attempted to reorganize my whole project and suddenly none of my tilesets were loading. After stressing out for a minute about this, I found that if I decided to add tileset rather than load tileset it would actually continue to allow me to paint on the object. Unfortunately this creates a duplicate tileset in blenders data every time I do it, but that's not a huge deal all things considered. I also wanna thank you for making such an incredible tool for blender ! I am currently working on a demo level for a game I am creating using sprytile heavily... I don't know what I would have done without it, you are seriously the absolute OG Jeiel Aranal! Thank you so much for your efforts. Hmm, that sounds like something I need to look into. I've added recent code to make loading tilesets much cleaner but I don't think I've taken those cases into account.